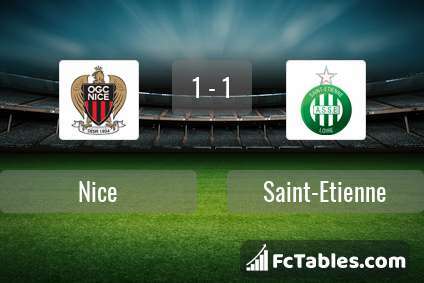 Match Nice-Saint-Etienne Ligue 1 the fixture is set to kick-off today 16:00 on Allianz Riviera. Refereee Thomas Leonard. Team Nice is located in the middle of the table. (7 place). Last 5 games (league + cup) finished balance 11 points. Nice did not win the match from 2 games. from 6 matches team have not been defeated. The most goals in Ligue 1 for Nice scored: Allan Saint-Maximin 3 goals, Wylan Cyprien 2 goals, Bassem Srarfi 1 goals. Players with the most assists: Allan Saint-Maximin 2 assists. In Nice not occur in the match due to injury: Myziane Maolida, Yoan Cardinale. Team Saint-Etienne is located in the middle of the table. (6 place). Saint-Etienne in 5 last matches (league + cup) have collected9 points. Saint-Etienne did not win the match away from 4 games. Leading players Saint-Etienne in Ligue 1 is: Wahbi Khazri 8 goals, Lois Diony 4 goals, Remy Cabella 3 goals. Most assists in the club have: Wahbi Khazri 1 assists, Lois Diony 1 assists, Remy Cabella 2 assists. In Saint-Etienne not occur in the match due to injury: Gabriel Silva, Romain Hamouma, Mathieu Debuchy, Neven Subotic. Direct matches: usually ended with winning of Nice. Balace of both teams games are: 16 won Nice, 13 wins Saint-Etienne, 7 draws. In 12 matches the sum of the goals both teams was greater than 2.5 (Over 2.5). On the other hand, 24 matches teams scored more than 1.5 goals (Over 1.5). In 12 matches the both teams have shot at least one goal.